I had to call the police last Thursday because a man tried to break into our house. I’ve always been strict about keeping doors locked, even when we’re home, regardless of where we live, because I’m an anxious sort. This practice paid off. When he couldn’t get in the door, he went around to the bedroom windows with a metal bar and I caught him peering in. Imagine our mutual surprise when I walked into the room. Brian had texted me just before 5:00 p.m. to say he was heading back from OKC. I was happily ensconced in his chair with a big orange cat in my lap, about to watch Dark Shadows again because it was on TV when I heard our back storm door open. The knob on the inner door turned and caught, a couple of loud taps sounded against the glass, and the outer door closed. I got up to investigate because I was pretty sure Brian hadn’t teleported home. 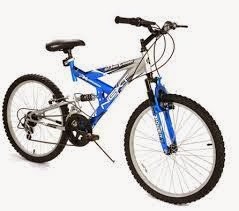 No one was at the door, but a rather nice blue and silver mountain bike exactly like the one pictured below was sitting under our carport. At that point I figured a kid was here trying to sell stuff (Girl Scout cookies?! ), so I went to look out the other windows. The would-be burglar was standing in my flower bed (!!) with his face mashed against the window and both hands cupped around his eyes to see through the glass. He squawked when I came through the bedroom door. He looked to be in his 50s, short and skinny, with white stubble on his face and a dirty sock hat on his head. The metal bar was tucked into the top of his pants. He bellowed “Is Frankie here?” through the window at me. I blinked and asked who. He said, “Is there a Frankie here?” I said “Sorry, no.” He said sorry several times, sprinted around the corner of the house to his bike, and rode like the wind out of the driveway. The fact that he was riding in the direction of the police station makes me giggle now. At the time, I was totally creeped out but didn’t realize what had just happened. It wasn’t until I was texting the story to Brian that I processed the situation and understood I had interrupted a break-in. We’ve lived here for ten years, and while the area seems to get worse by the day, nothing like this has ever happened to us. Also, because I’m an anxious sort, I have to actively remind myself that most people don’t have criminal/horrible intentions, so my own daffy brain gummed up the works there. Calling the police hadn’t occurred to me at all until Brian suggested it. So I did. The dispatcher was kind and professional as she took the report and set us up for an extra patrol. I was pretty rattled and she made me feel better. Thumbs up, lady. Keeping the doors locked at all times turned out to be an excellent idea. Paranoia vindicated! We are getting a security system. When Brian got home and asked if I wanted the one we had talked about previously, I said yes. It costs less than the video games we used to play and will allow me to sleep again. We are going to move. That experience was profoundly motivating for me to make more money this year and get a new house. Our neighborhood has become Creepy McSuckville and I am freaking done with it. This is not the post I had envisioned starting the year, but hey, learning experiences should be shared. Remember to keep your doors locked, kids! I sure will!